Aerospace craft are the only vehicles having motion in 3D space with intensive dynamics, making it necessary to control such vehicles in 6D motion (linear and angular). Navigating with these spatial constraints, in all kinds of weather and environments requires complex and highly reliable controls and systems. 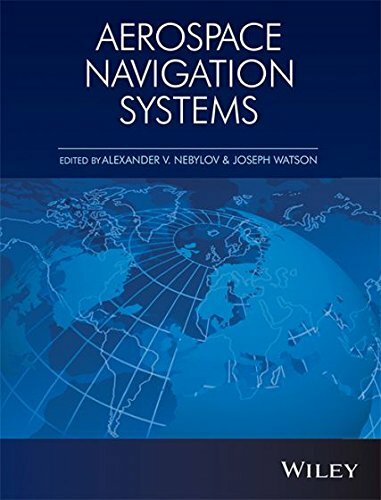 This new book explains the latest in electronic navigation for aerospace vehicles, including the latest in use of satellite communications and GPS navigation. It offers a particular focus on different kinds of radio-navigation and guidance systems for aeronautical and space vehicles that may be used for motion control, together with other aerospace sensors (described in the MP book Aerospace Sensors). Aerospace engineers in both design and research will find this book to be an invaluable, comprehensive introduction to the very latest technologies in motion control for all types of aerospace vehicles, from aircraft, to unmanned aerospace vehicles, to missiles, and to spacecraft. Highlights include coverage of: Radio Systems for Long-Range Navigation and Short-Range navigation; Radio-based Technical Landing systems; Satellite Navigation; Systems Map-matching systems; Correlated-external; Systems and Sensors Homing Devices; and Inertial Navigation Systems, using gyroscope and accelerometer integration. Alexander Nebylov St. Petersburg, Russia, Ph.D, State University of Aerospace Instrumentation, St. Petersburg Aerospace Institute, Russia.